Curmudgeon writes book about running, in which he reminds you over and over that 40 years ago he won the Boston Marathon, and that the only worthwhile running development since then is wicking socks. I was given a review copy of Amby Burfoot’s new book Run Forever. Burfoot won Boston in 1968 and went on to become executive editor of Runner’s World. He retired in 2013, but has not retired the word “scrumptious,” nor reminding you that he won Boston in 1968. Hey did you know Burfoot won Boston? Around the same time he also participated in a study into hydration and performance. He states that the results of the study showed he performed best on Gatorade, and worst drinking nothing, a result that pretty much anyone would say, “duh.” Except for Burfoot. He writes that one month after the study he runs (and wins the Boston Marathon) “without drinking anything en route” and goes on to declare: “I’m […] quite sure that, if someone had given me Gatorade on the course, I wouldn’t have run as well.” Reading Run Forever felt like reading a book about running written by Kurtwood Smith in full Red Forman. Once you get past surely old man writing about how he likes things the old fashioned way, the book is a decent compilation of running how-to with some good advice, but in that it is by no means unique and I think there are much better options out there. Whenever I get a new book, especially non-fiction, I like to look through the table of contents. If you read my 2018 week twenty three last week you may recall that I developed a shin splint while on holiday. Burfoot in Run Forever devotes a section to injuries, and a “chaplet” (his word for “chapter”) to shin splints, in which he says that pretty much every runner gets them, but that they’re something beginning runners suffer with, and “once you move past an initial bout, they rarely come back.” My first bout of shin splints came in the beginning of this year, and my physiotherapist put the Fear of God (or Saint Sebastian?) into me about proper care lest I develop a stress fracture. Burfoot, on the other hand, writes, “Shin splints are the perfect example of how most running injuries aren’t serious. You get them, then you get over them.” The bigger problem I have with this book is that there’s some really bad advice. And yet I’ll probably buy a hardcopy for my library. Thanks to Centre Street for the review copy. 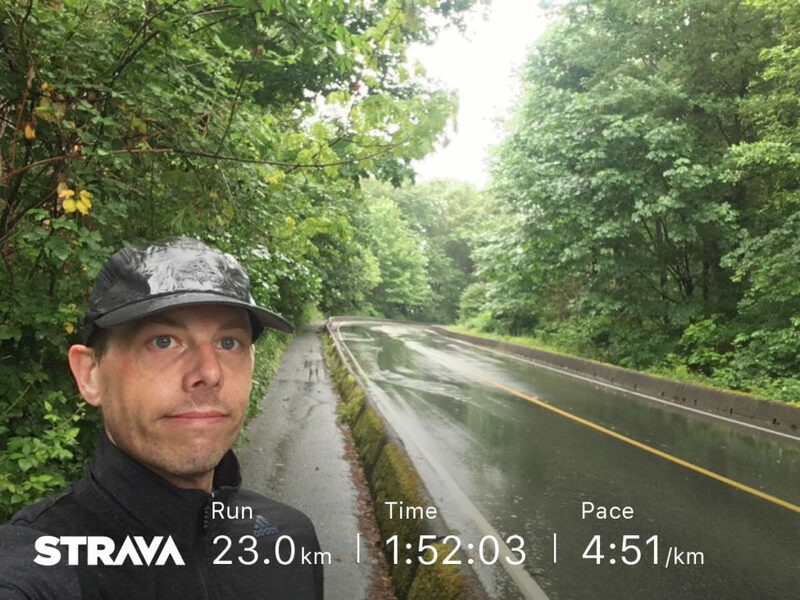 On Wednesday I went for a run in the rain up to UBC and back home following most of the impending Scotiabank Half Marathon route and I should have trimmed my toenails because my left big toenail had gotten a little too long and by the time I finished my descent of Marine Drive it was pretty uncomfortable. So after some 6,000 KM running I got my first black toe badge, and damnit I had no idea how debilitating it is. Thursday was a write-off but by Friday evening I forced myself back outside. It did not feel great but I pushed through, and then it felt better, and better Saturday, and better today. Whether the toenail falls off or not remains to be seen. I’m hoping it makes up its mind soon. 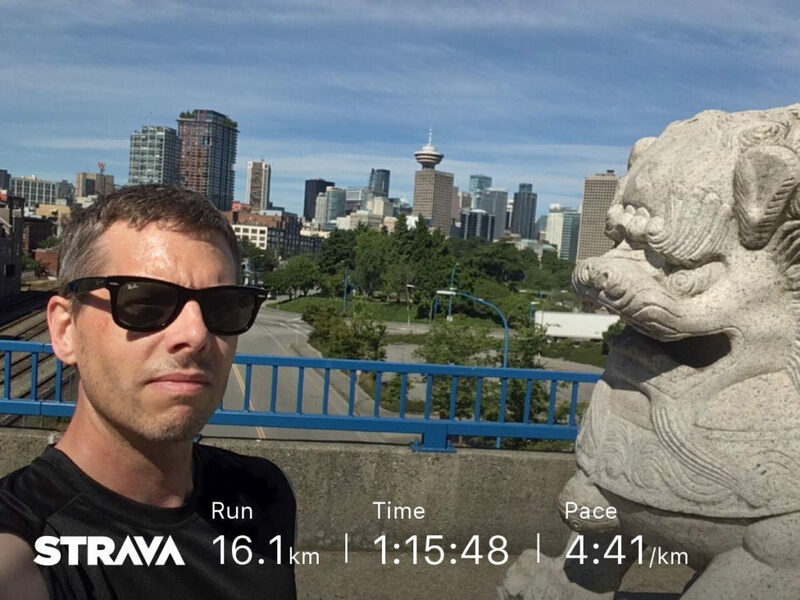 One week until Scotiabank Half. And sixteen weeks until Victoria Marathon.